More Of Him: Family Works DVD - 50% today! 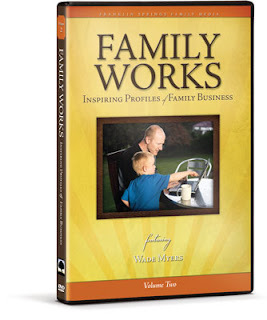 Family Works DVD - 50% today! I have been wanting this DVD for a long time and today, it's available at 50% off from Vision Forum!! My husband and I have worked together through the years and are now thinking we would like to do something together again. We enjoy working together and think family businesses are so wonderful. We have bought many DVD's from Vision Forum and are quite sure that this DVD will be just as inspiring and helpful as the other programs we have watched. We are always so pleased with the quality of the programs from Vision Forum. I'm so happy that we can buy this at 50% off!! Things are pretty tight for a lot of people (including us) and being able to get this at such a reduced price is such a blessing. You can click on the picture above and it will take you to the page where you can purchase this. I'm definitely going to get one! !